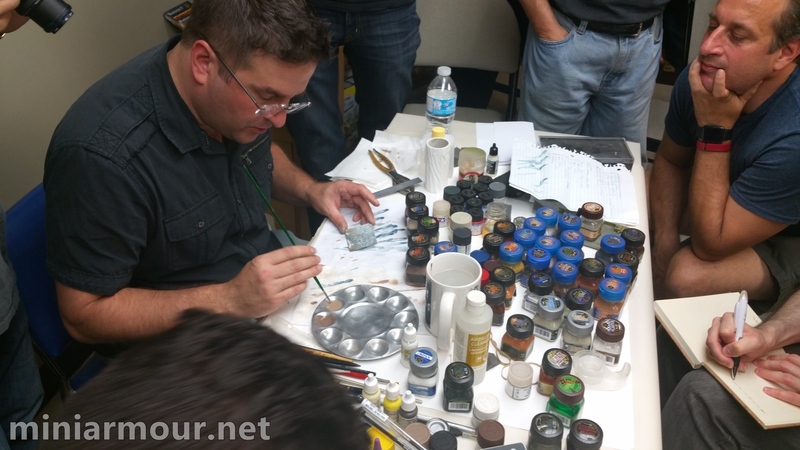 As I have already mentioned here, this past weekend modelers in Toronto had a unique chance to attend a seminar with Adam Wilder. As a big fan of Adam’s work I couldn’t have missed this chance to see his work and learn something new. Seminar was really great experience, Adam has demonstrated many of his techniques and we could closely watch the magic to happen. Winter wash, chipping, dust, streaking, mud, speckling, you name it, all of the current popular techniques were walked through with as much clarity as you can get from personal experience. Adam has brought few of his pieces and I just find the opportunity to study his models as a great learning opportunity. My photos really don’t do the justice to his models, they have been features in modelling magazines in higher quality, but seeing them live is simply best. Adam has also brought number of products from his new line of weathering and finishing products, these were used in the demonstration so at the end I had good understanding of how these can be used to achieve different effects. Overall I believe that this is the kind of experience is the best to enhance one’s modelling skills in a way that cannot be matched by any other means. Thanks goes to Adam for coming to Toronto and I hope he had at least such a good time as me and my friends had. For all those who haven’t had a chance to come – make sure to visit Adam’s new website (here) featuring a lot of useful videos and tutorials.